It is with deep regret that we here at Saginaw Gears Dot Com must inform you of the passing of Gears defensman Gary Sittler. Reports are that Gary suffered a heart attack and passed away in the last week of February, 2015. After playing junior hockey with the London Knights of the OHA from 1969 to 1973 Sit moved on to the EHL and the Suncoast Suns for one season. From there he moved to the NAHL and the Syracuse Blazers until coming to Saginaw and the Gears for the 1975-76 season. At 5' 9" and 185 he added a lot of grit to the Gears. A down-to-earth and quiet guy when not around his teammates, Sit was absolutely fearless on the ice and set a good example for us amateurs out there who were also playing the game and were five foot and less than a dozen tall. He often took on and fought guys well over his weight and girth and made them pay a price. Yet, he could thread a needle with a puck and sent passes through crowds hitting his forwards on the tape almost every time. In his three seasons with the Gears plus the 1977 Turner cup playoff run he totaled 125 assists. Again, another lesson for those of us who watched the Gears and then played for fun; an assist is just as good as a goal, and sometimes better. Sit also had a slap shot that was remarkable. Once in a game at Wendler Arena he fired a shot that took a lift and zinged up into the stands, glanced off the armrest of an empty seat and impacted way up on the upper wall of, what was then, Section 3, just to the lower end of the digit "3." It made a mark that remained there as long as the Gears played in that building. 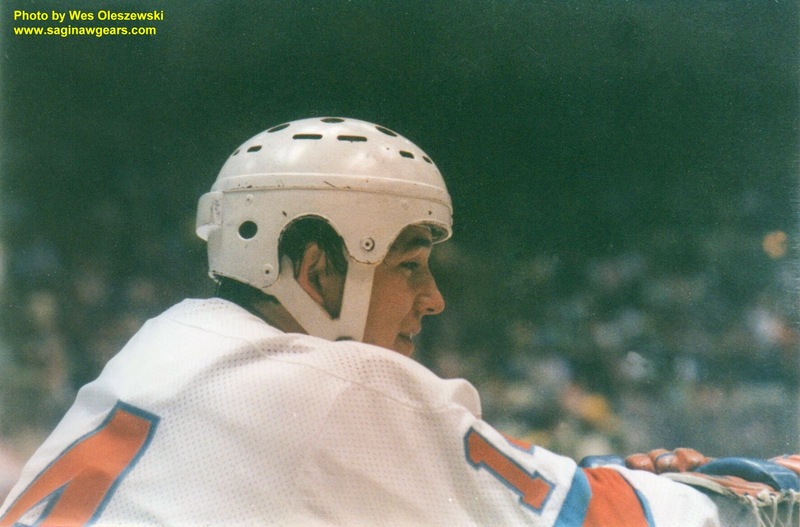 Sit was loaned back to the Blazers for the balance of the 1976-77 regular season, but returned to the Gears for the 77 Turner Cup playoffs. When he came back, we all knew that this was it- we were gonna win. In November of 2014 he returned to Saginaw from his home in Fort Nelson BC and took part in the ceremony of the induction of the Gears into the Saginaw Sports Hall of fame. he also got to reunite with many of his former teammates. To me, Gary Sittler was one of the players who represented what hockey was all about; grit, speed, precision, team work and modesty. In the weeks ahead I'll be posting a story called, "1,2,3, yer' out!" in the 1975-76 section and it involves Gary Sittler. Check back and you'll see when it is up.